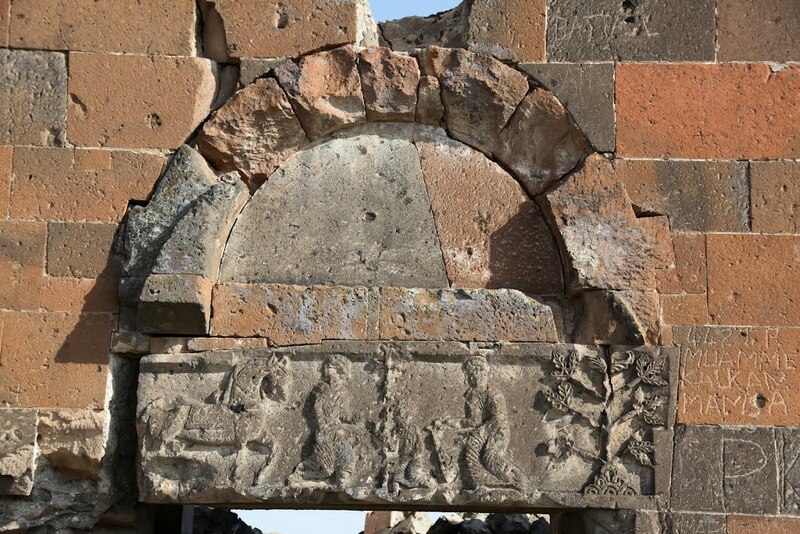 Sculpted images on the exterior of the 7th century Armenian Cathedral of Mren may reveal more than meets the eye. 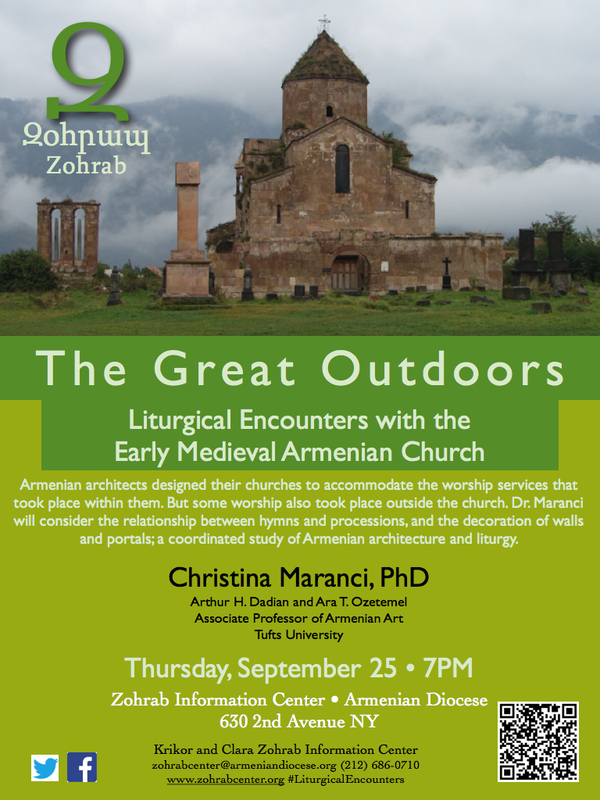 The distinguished expert in Armenian Art and Architecture, Professor Christina Maranci, will present an illustrated lecture at the Zohrab Center on Thursday, September 25 at 7PM entitled, The Great Outdoors: Liturgical Encounters with the Early Armenian Church. Dr. Maranci is the Arthur H. Dadian and Ara T. Ozetemel Associate Professor of Armenian Art at Tufts University. She will present the results of recent research on the exterior structure and decoration of certain medieval Armenian churches. Maranci believes that the intricate carved images and the epigraphic writings that adorn the exterior walls of many Armenian Churches were not produced simply to beautify the buildings. Instead, she suggests that the Armenian architects and artisans were guided by liturgical services that took place outside the church. Maranci supports her view with Armenian hymns and rituals found in medieval Armenian liturgical books. This coordinated study of architecture and liturgy provides a potential material setting for liturgical texts, suggests new interpretations of the relief sculpture, and offers insight into the medieval experience of the Armenian Church. Prof. Christina Maranci is an expert on medieval Armenian architecture. Prof. Maranci received her Ph.D. from Princeton University in the Department of Art and Archaeology in 1998. She has lectured and published widely, particularly in the area of Armenian architecture. Her books include Medieval Armenian Architecture: Constructions of Race and Nation (Peeters, 2001), and Vigilant Powers: Three Churches of Early Medieval Armenia (Brepols, forthcoming). Her articles have appeared in the Revue des études arméniennes, Dumbarton Oaks Papers, Gesta, the Journal for the Society of Architectural Historians, the Art Bulletin, the Oxford Companion to Architecture, and the Oxford Dictionary of the Middle Ages. Her recent work on the Cathedral of Mren (Kars region, Eastern Turkey) led to the successful application for its inclusion in the World Monuments Fund Watch List for 2014-17. She is campaigning to increase awareness of the fragile condition of this significant monument and others in the Kars/Ani region. The lecture will take place in the Guild Hall of the Armenian Diocese, 630 Second Avenue, New York. It is free and open to the public. A reception and refreshments will follow. For more information contact the Zohrab Center at zohrabcenter@armeniandiocese.org or (212) 686-0710. Follow us on Facebook and Twitter #LiturgicalEncounters. « The Canonization of the Armenian Martyrs of 1915. What is Christian Martyrdom Anyway?